On September 25, 2018, Rocky View County Council unanimously approved an application to redesignate a 10km stretch of abandoned railway between Beiseker and Irricana to allow for the development of the Meadowlark Trail; a missing link in world’s longest recreational trail, The Great Trail. The abandoned CPR land was donated to the Great Trail (formerly known as the Trans Canada Trail) in 1999 and transferred to Alberta TrailNet in 2005, who has been working to realize their vision for the Meadowlark Trail ever since. Although identified in the Rocky View County’s Parks and Open Space Master Plan as a gap in the regional trail network, Alberta TrailNet was unsuccessful in their first attempt to redesignate the land in 2011. At the time, Council advised TrailNet to complete a more robust public engagement and communication process, and to develop a more detailed proposal for the trail. Approximately one year ago, TrailNet approached B&A Planning Group to assist them on their second attempt at gaining Council approval, which would not only allow the construction of two creek-crossing bridges to commence, but would also secure funding to construct the trail. Up for the challenge, B&A assembled a multi-disciplinary project team to fulfill Council’s recommendations and to support TrailNet’s vision and passion for realizing their goal of building the Meadowlark Trail. Steve Morris, Creative Services Lead and John Popowich, Senior Graphic Designer, developed a visual identity and logo that were used throughout all Meadowlark Trail communications, promotions and documentation, and will be used on all future materials including signage along the future trail. Tamille Beynon assisted the Meadowlark Trail Society in developing and implementing a multi-faceted communications and engagement process that generated awareness, facilitated conversation, collected feedback and proactively addressed issues and concerns. This engagement plan consisted of “kitchen table” conversations with adjacent landowners, which resulted in a number of proposed mitigations to alleviate concerns. The plan also included two public open houses, an online survey, a What We Heard report and continuous engagement through social media and email updates. Throughout the year, nearly 100 letters of support were collected and provided to Council with the application. David Wyatt and Jonathan Schmidt lead the application process for TrailNet with the development of a Direct Control (DC) Bylaw as well as a Trail Management Plan that outlines and determines trail access points, trail inspection requirements, weed control, types of uses, signage, landscaping, operation, maintenance and more. 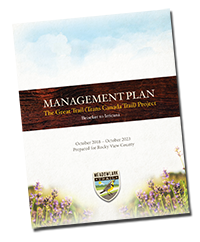 The Trail Management Plan promotes a “Good Neighbour Policy” to ensure positive relationships are maintained with adjacent landowners in the future. Upon receiving unanimous Council approval for the land use redesignation, B&A looks forward to continuing to support Alberta TrailNet in obtaining development permits that will lead to the construction of the Meadowlark Trail.